Winter coats taking up too much closet space? When it’s time for spring cleaning, there’s no need to go full KonMari—stick to a simple approach to cutting closet bulk & making room for summer items. Turn on some tunes & tackle this project with these 6 easy tips. Use this summer prep session to take stock of pieces that don’t fit or simply aren’t getting worn. A good rule of thumb: If it’s been on the hanger for more than two months, toss it. Cardigans taking up too much space? 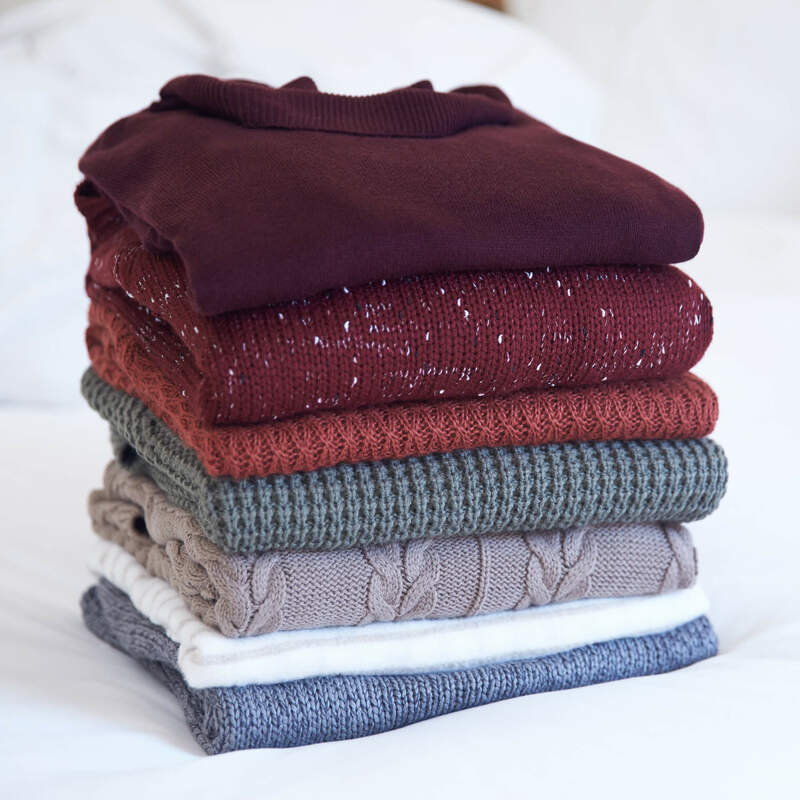 Prep them for hibernation by hand washing & folding them (never hang!). Store them in breathable garment boxes or vacuum-sealed bags. Worried about moths? Use natural repellents like cedar or lavender. Those winter layers are best kept on sturdy hangers and—in a perfect world—neatly tucked away in separate garment bags. For those of you with limited storage space, the vacuum-sealed route works here, too. Dry clean your most-loved pieces and remember to remove everything from your pockets before storing. Closet cleaning can be daunting. The good news is, organizational tasks are highly addictive. Once on a path to a clutter-free closet, you’ll start getting creative! Finished packing your winter pieces? Store them in a space out of the way that’s clean, dry, cool & dark (like under your bed). Ready to say goodbye to your favorite winter boots? If they’re tall boots, stuff them with newspaper or invest in boot forms to help keep their shape. More of an ankle boots girl? Lay them flat in a plastic container and loosely place tissue paper around them. To give them some TLC, rub them down with a high quality leather lotion before you store them. Clean, well taken care of shoes are always a nice surprise come fall. Linen, cotton & rayon are a few summer-perfect fabrics that allow our bodies to breathe and move easier as temperatures rise. Another benefit to wearing these airy styles? Your summer vacation packing will be lighter, too! Replace the pieces you just packed away with these essential fabrics. Is warm-weather wardrobe prep part of your spring cleaning routine? Share your tips in the comments below.